Whooping Cranes from the only wild population on earth have been “stopping over” on Waco Lake in Texas for at least seven years – perhaps longer. Friends of the Wild Whoopers (FOTWW) president Chester McConnell explained that these stopovers are expect to continue and increase. According to scientific studies by United States Geological Survey (USGS), Whooping Cranes have been recorded on the lake during 2011 (fall); 2015 (fall); and 2016 (spring). McConnell believes that it is likely that more Whoopers visited the lake but were not recorded because only about one-third of the cranes in the population had radio-tagged tracking equipment attached to them. What makes the stopovers on Waco Lake a bit surprising is that it is located within the city limits of Waco in central Texas. This U.S. Army Corps of Engineers (COE) lake is about half way between Dallas/Ft.Worth and Austin. In past years, it has been rare for Whoopers to stopover near population centers with all the noise and traffic. Yet, according to McConnell stopping in populated areas may become more frequent because many traditional stopover habitats have been destroyed due to numerous land developments. It appears that Whooping Cranes may be following the example of an increasing number of wild animals visiting in cities because man is eliminating their natural wild habitats. The wild Whooping Crane population is also increasing in numbers which FOTWW believes is wonderful. Man caused these birds to come close to extinction but their population has slowly crawled back during the past 70 years. These wild cranes rear their young in Wood Buffalo National Park in remote northern Canada. Their population has increased from 16 birds in 1943 to 431 in 2017. Fortunate their Canada nesting habitat is currently healthy and secure. Unfortunately the Whooping Crane’s “stopover habitats” in the six state migration corridor (ND, SD, NE, KS, OK and TX) and their winter habitat on Aransas Refuge on the Texas coast is declining. This does not bode well for Whoopers. FOTWW has developed a program to help protect and manage “stopover habitats” in the six state Whooping Crane migration corridor from North Dakota to the Texas coast. FOTWW began its program by working with military bases located within the corridor. FOTWW contacted each base and visited all that had wildlife programs and wetland habitats. Whooping Crane habitat plans were developed for all suitable bases. Because the bases are federal land, there was no requirement to purchase expensive property. Following the program on military lands, FOTWW visited Indian Reservations to evaluate their lands for Whooper stopover sites. McConnell revealed that the Reservations had an abundance of quality stopover habitats. Management plans were prepared to help protect existing habitats and to improve others needing management. Again, there was no need to purchase land which should increase the success of management efforts. Whooping Crane “stopover habitats” are also increasing in importance on COE lakes according to McConnell, He explained that, “Due to numerous land use changes on private lands, many wetlands and ponds that once served as Whooping Crane habitat are being drained and converted to other uses. So the large COE lakes are being used more and more by the cranes.” Because of these problems the COE and FOTWW have joined together and are operating under a Memorandum of Understanding to help solve the problems. McConnell visited Waco Lake on April 9, 2018 to assess potential “stopover habitats” for Whooping Cranes. Michael Champagne, USACE – Natural Resources Specialist, Fort Worth District made arrangements for the trip and participated in our visit to the lake. After discussing the natural resource objectives for Waco Lake we made a tour of the lake property to examine the most likely places that would provide Whooping Crane “stopover habitats”. Three Texas Parks and Wildlife Game Wardens joined us for part of the trip and took us in their jet boat to islands in the lake. FOTWW appreciates all involved with making preparations for a productive and enjoyable visit. Today, however Whooping Cranes are facing more threats to their habitats. During their 2,500 mile migration from Canada to Texas they must stop 15 to 30 times to rest and feed. Secure stopover habitats are needed throughout the migration corridor approximately every 25 miles. And more secure wintering habitats are needed along the Texas coast near the Aransas National Wildlife Refuge. Currently about half of the population winters off the Aransas National Wildlife Refuge where they are not as safe. Continuous development along the coast is also taking a serious toll on habitat. Figure 2. Photo of one end of an island (No. 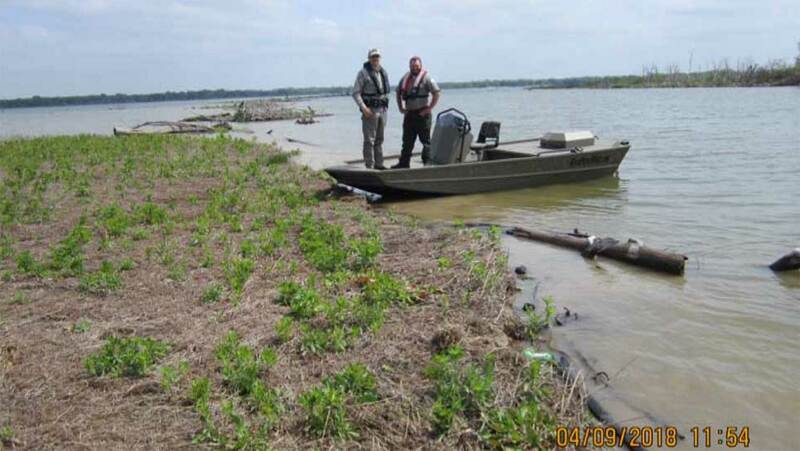 1) in Waco Lake. 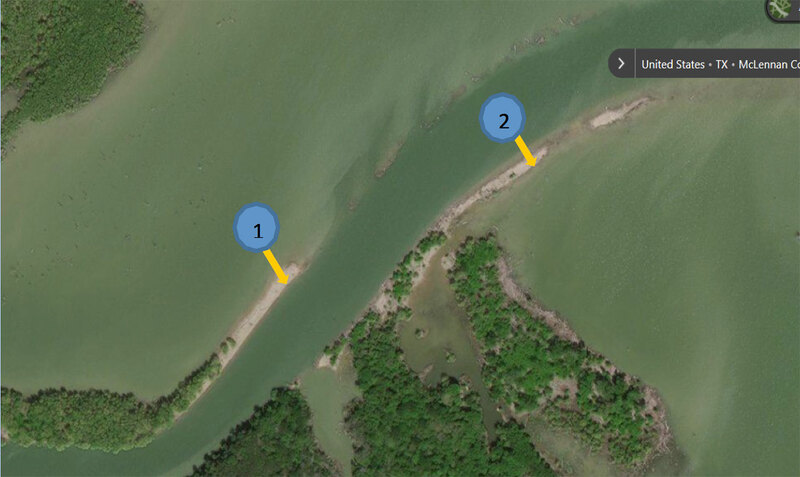 Flight paths for Whooping Cranes approaching the island are available from all directions. No thick bushes or trees are in or near the landing site. There is extensive horizontal visibility from the roost site so predators can be readily detected. This is excellent Whooping Crane stopover habitat.